On Monday, news broke that Office Depot was in merger talks with competitor OfficeMax. Today, Office Depot announced earnings. In the earnings release, there was a mention of the merger – even though it hadn’t been officially confirmed. The release then disappeared from the company’s investor relations page and the SEC’s website. Now, Bloomberg reports that the merger has been confirmed. NAPERVILLE, Ill. and BOCA RATON, Fla., Feb. 20, 2013 /PRNewswire/ — OfficeMax Incorporated (NYSE:OMX) and Office Depot, Inc. (NYSE:ODP) today announced the signing of a definitive merger agreement under which the companies would combine in an all-stock merger of equals transaction intended to qualify as a tax-free reorganization. The transaction, which was unanimously approved by the Board of Directors of both companies, will create a stronger, more efficient global provider better able to compete in the rapidly changing office solutions industry. Customers will benefit from enhanced offerings across multiple distribution channels and geographies. The combined company, which would have had pro forma combined revenue for the 12 months ended December 29, 2012 of approximately $18 billion, will also have significantly improved financial strength and flexibility, with the ability to deliver long-term operating performance and improvements through its increased scale and significant synergy opportunities. Under the terms of the agreement, OfficeMax stockholders will receive 2.69 Office Depot common shares for each share of OfficeMax common stock. Merger of Equals Structure: OfficeMax and Office Depot will have equal representation and governance rights on the combined company’s Board of Directors and equal input on key decisions. With an all-stock merger, OfficeMax and Office Depot stockholders will benefit proportionately from the synergies achieved as a combined company. Enhanced Financial Performance: The combined company is positioned to deliver long-term operating improvement, with greater potential for earnings expansion and improved cash flow generation. Significant Synergy Opportunities: The merger is expected to deliver $400-$600 million in annual cost synergies by the third year following the transaction’s close by leveraging both operating and G&A efficiencies. Financial Strength and Flexibility: On a pro forma basis as of December 29, 2012, the combined company would have had more than $1 billion in cash on hand and more than $1 billion available through revolving credit facilities, giving it the flexibility to invest in both its current business and future growth opportunities. Increased Scale and Competitiveness: The combined company will be well positioned to optimise its shared multichannel sales platform and distribution network, primarily in North America. Together, the companies will provide a wide array of services and solutions that enable customers to work more efficiently and productively. By implementing best practices in sales, operations and management, the combined company is expected to be better able to compete with the many online retailers, warehouse clubs and other traditional retailers that are placing a greater emphasis on office product sales. Broader Global Footprint: The merger will combine the two companies’ complementary international businesses, with minimal overlap, strengthening the combined company’s ability to serve customers around the world. Improved Customer Experience to Build Brand Loyalty: Consumers and business-to-business customers are increasingly demanding a seamless omnichannel experience across retail stores, direct sales, telesales and digital environments. By integrating these touchpoints effectively, the combined company expects to build lasting brand loyalty. Accelerated Innovation: Both companies anticipate sharing customer insights and learnings from innovative pilot programs underway to better identify and fulfil evolving customer needs. Following the closing, the combined company’s newly constituted Board of Directors will include equal representation and governance rights from each of the two companies. The parties have also agreed to form a selection committee made up of an equal number of independent Board members from each company that will oversee the search process for naming the CEO for the combined company. Both incumbent CEOs, as well as external candidates, will be considered in the search process. Neil Austrian, the Chairman and CEO of Office Depot, and Ravi Saligram, the President and CEO of OfficeMax will remain in their current positions through the completion of the search process. The combined company’s management team is expected to draw upon the experienced group of leaders from both companies. The combined company’s name, marketing brands and corporate headquarters location are expected to be determined following the appointment of the CEO for the combined company. The transaction is expected to close by the end of calendar year 2013, subject to stockholder approval from both companies, the receipt of regulatory approvals and other customary closing conditions. Under the merger agreement, OfficeMax will have the ability to declare and pay to its common stockholders aggregate cash dividends of up to $131 million ($1.50 per common share) before the closing of the transaction. Payment of dividends would not affect the exchange ratio in the transaction. In connection with the transaction, BC Partners, Inc. and its affiliates, which hold preferred stock representing approximately 22 per cent of Office Depot on an as-converted basis, have agreed to vote in favour of the merger. In addition, BC Partners has agreed that as of the closing, its remaining equity stake will consist of common shares representing an amount no more than 5 per cent of the voting capital stock of the combined company as a result of the combination of the redemption of preferred shares, conversion to common shares and open market sales of such common shares and repurchases by Office Depot. Following the closing, BC Partners will have no Board designees or other contractual governance rights related to the combined company. J. P. Morgan Securities LLC served as exclusive financial advisor to OfficeMax, and provided a fairness opinion to the Board of OfficeMax, and Skadden, Arps, Slate, Meagher & Flom LLP and Dechert LLP acted as legal counsel to OfficeMax. Peter J. Solomon Company, L.P. and Morgan Stanley & Co. LLC acted as financial advisors and provided fairness opinions to the Board of Office Depot, and Simpson Thacher & Bartlett LLP acted as legal counsel to Office Depot. Kirkland & Ellis acted as legal counsel to the Board of Office Depot. In connection with the transaction, Perella Weinberg Partners acted as financial advisors to the Transaction Committee of Office Depot’s Board of Directors and Kirkland & Ellis LLP served as the Committee’s legal advisor. OfficeMax and Office Depot will host a joint webcast today at 11:00 a.m. Eastern Time (10:00 a.m. Central Time) to discuss the proposed merger. Participants will include Ravi Saligram, President and CEO, OfficeMax; Bruce Besanko, EVP, Chief Financial Officer and Chief Administrative Officer, OfficeMax; Neil Austrian, Chairman and CEO, Office Depot; and Mike Newman, EVP and Chief Financial Officer, Office Depot. The live audio webcast of the conference call, as well as a related slide presentation, can be accessed at either the “Investors” section of OfficeMax’s website at http://investor.officemax.com or the “Investors” section of Office Depot’s website at www.officedepot.com. The webcast and a podcast will be archived and available online on each company’s website for at least 30 days following the call. Office Depot and OfficeMax will each announce results for their fourth quarter and full year 2012 this morning before the market opens. This content can be accessed, respectively, at the “Investors” section of Office Depot’s website at officedepot.com and on the “Quarterly Earnings” page located within the “Investors” section of OfficeMax’s website at investor.officemax.com. 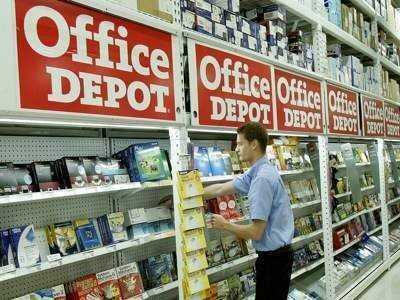 A press release announcing the merger of the two office supply retailers briefly surfaced Wednesday on Office Depot’s Web site. Since then, the announcement has disappeared. The deal negotiations are ongoing, according to two people with knowledge of the matter. As of Wednesday morning, the company’s bankers and lawyers were still attempting to finalise an agreement. On February 19, 2013, the Company entered into a definitive merger agreement with OfficeMax Incorporated, pursuant to which the Company and OfficeMax would combine in a tax-free, all-stock merger transaction. At the effective time of the merger, the Company would issue 2.69 new shares of common stock for each outstanding share of OfficeMax common stock. In addition, at the effective time of the merger, the Company’s board of directors will be reconstituted to include an equal number of directors designated by the Company and OfficeMax. The parties’ obligations to complete the merger are subject to several conditions, including, among others, approval by the shareholders of each of the two companies, the receipt of certain regulatory approvals and other customary closing conditions. Boca Raton, Fla., February 20, 2013 — Office Depot, Inc. (NYSE: ODP), a leading global provider of office supplies and services, today announced results for the fiscal quarter and full year ended December 29, 2012. Total Company sales for the fourth quarter of 2012 were approximately $2.6 billion, down 12% compared to the fourth quarter of 2011. Sales for the fourth quarter of 2012, on a constant currency basis, were down approximately 11% versus prior year. The 53rd week added approximately $140 million of sales in the fourth quarter of 2011. Excluding the benefit of the additional selling week in 2011, fourth quarter of 2012 constant currency sales would have been down 7%. The Company reported a net loss, after preferred stock dividends, of $17 million or $0.06 per diluted share in the fourth quarter of 2012, compared to net earnings, after preferred stock dividends, of $12 million or $0.04 per share in the fourth quarter of 2011. Fourth quarter of 2012 results included approximately $12 million of pre-tax charges primarily related to restructuring activities and actions to improve future operating performance, and approximately $9 million related to non-cash asset impairment charges in the North American Retail Division. Excluding the restructuring and impairment charges (after tax), fourth quarter of 2012 net earnings, after preferred stock dividends, would have been approximately $1 million or zero cents per share. Fourth quarter of 2011 results included approximately $23 million of pre-tax charges primarily related to restructuring activities and actions to improve future operating performance. Fourth quarter of 2011 results also included a $24 million tax benefit related to the reversal of an uncertain tax position accrual and the release of a valuation allowance. Excluding charges and tax benefits, net earnings, after preferred stock dividends, would have been $8 million or $0.03 per share in the fourth quarter of 2011. Total Company gross profit margin decreased approximately 40 basis points in the fourth quarter of 2012 compared to the prior year period. This decline was due primarily to the benefit of the 53rd week in 2011 from rent costs being amortized over previous periods in North American Retail and lower sales volume in International. Total Company operating expenses decreased by $108 million in the fourth quarter of 2012, compared to the prior year period, including the benefit from one fewer week of operating expenses in the fourth quarter of 2012. Earnings, before interest and taxes (EBIT), adjusted for charges, were $34 million in the fourth quarter of 2012, compared to EBIT, adjusted for charges, of $47 million in the prior year period. The effective tax rate for the fourth quarter of 2012 was negative 23%, compared to negative 111% for the same period in 2011. The effective tax rate for the fourth quarter of 2011 includes tax benefits of $24 million from the reversal of an uncertain tax position and the release of a valuation allowance. The Company ended the fourth quarter of 2012 with free cash flow of $64 million, compared with free cash flow of $139 million reported in the prior year period. The North American Retail Division reported fourth quarter of 2012 sales of approximately $1.1 billion, a decrease of 13% compared to the prior year. Excluding the $78 million sales impact from the additional selling week in the fourth quarter of 2011, the year-over-year sales decrease would have been less than 8%. Comparable store sales in the 1,079 stores that have been open for more than one year, and aligned to match the same selling weeks, decreased 6% for the fourth quarter of 2012. Sales of notebook computers and software decreased in the fourth quarter versus prior year, while sales of tablets, ereaders and desktop computers increased. Copy and Print, and cleaning and breakroom supplies sales also increased, while sales of office supplies and furniture declined versus prior year. Average order value was relatively flat in the fourth quarter and customer transaction counts declined approximately 5% compared to the same period last year. The North American Retail Division reported operating income of $11 million in the fourth quarter of 2012, compared to operating profit of $32 million in the same period last year. Included in the fourth quarter 2012 operating profit are approximately $9 million of charges, primarily related to store asset impairment. Excluding the charges and $11 million benefit of the additional week for the fourth quarter of 2011, the slight year-over-year operating profit decline was driven primarily by the negative flow-through impact of lower sales, partially offset by operational improvements. At the end of 2012, Office Depot operated 1,112 stores in the U.S. and Puerto Rico. The North American Retail Division opened two new stores and closed four during the fourth quarter of 2012. The North American Business Solutions Division reported fourth quarter of 2012 sales of approximately $763 million, an 8% decrease compared to the prior year on a fiscal basis. Excluding the $34 million sales impact from the additional selling week in the fourth quarter of 2011, the year-over-year sales decrease would have been 4%. On a comparable sales basis aligned to match the same selling weeks, fourth quarter of 2012 sales would have been relatively flat versus prior year. Contract channel fourth quarter of 2012 sales were down versus last year as reported on a fiscal basis. Comparable sales in the fourth quarter of 2012, aligned to match the same selling weeks in 2011, were relatively flat. On the same basis, sales growth occurred across the contract channel’s small- and medium-sized business customers, driven by both acquisition and improved retention for customers managed by the new inside sales organisation. Similarly, sales to enterprise-level accounts and public sector customers also improved year-over-year as well, with the latter being driven by sales to educational and federal government customers. Sales weakness continued among state and local government accounts as these customers experience ongoing budgetary pressures. Direct channel fourth quarter of 2012 sales were down versus last year as reported on a fiscal basis. Comparable sales in the fourth quarter of 2012, aligned to match the same selling weeks in 2011, were relatively flat. While online sales were up year-over-year due to an increase in traffic and higher average order value, the direct channel experienced lower purchases from customers who shop using catalogues and place orders through inbound call centres. The North American Business Solutions Division reported operating income of approximately $55 million in the fourth quarter of 2012 compared to $45 million in the fourth quarter of 2011. The favourable comparison to the prior year includes approximately 60 basis points of higher gross margin driven by sales and margin initiatives, as well as lower supply chain, advertising and payroll costs. The International Division reported fourth quarter of 2012 sales of $789 million, a decrease of 13% in U.S. dollars and a decrease of 11% in constant currency sales compared to the prior year. On a comparable sales basis aligned to match the same selling weeks and excluding the $28 million sales impact from the additional week in the fourth quarter of 2011, fourth quarter of 2012 sales would have been down mid-single digits versus prior year. Total European contract sales decreased mid-single digits in the fourth quarter versus the prior year as growth in Germany and relatively flat sales in the U.K. were more than offset by weakness in other countries. In Asia, the contract channel reported relatively flat sales compared with one year ago. The rate of year-over-year sales decline improved again sequentially, on a comparable sales basis, in the European direct channel. European retail channel sales in the fourth quarter decreased compared to prior year as weakness in Sweden and Hungary more than offset a slight sales increase in France. In Asia, South Korean retail reported a slight sales increase in the fourth quarter versus prior year. The International Division reported operating income for the fourth quarter of 2012 of approximately $23 million, compared to $33 million in the same period of 2011. Included in these measures of Division operating profit are approximately $9 million of charges related to restructuring actions in 2012, and $15 million of restructuring charges in the same period in 2011. Excluding the charges in both periods, the remaining decrease in Division fourth quarter of 2012 operating profit reflects the negative flow-through impact of lower sales, partially offset by a decrease in operating expenses, driven by continuous process improvement initiatives, as well as lower advertising and payroll expenses. The movement in exchange rates had a minimal impact on International Division operating profit in the fourth quarter of 2012 compared to the same period in 2011. Office Depot’s Latin American joint venture, Office Depot de Mexico, reported fourth quarter of 2012 sales of $286 million, an increase of 2% in U.S. dollars and a decrease of 3% in constant currency versus the prior year. The joint venture added four stores during the fourth quarter for a total of 257 stores and distribution facilities in Mexico, Central America and Colombia at quarter end. Office Depot de Mexico reported fourth quarter of 2012 net income of approximately $17 million, versus $16 million one year ago. Office Depot accounts for this investment using the equity method and the 50% share of Office Depot de Mexico’s net income is presented in the Company’s Miscellaneous income, net in the Consolidated Statement of Operations. Full year of 2012 sales were $10.7 billion, a decrease of 7% from the prior year. Excluding the impact of a 53rd week in fiscal 2011, constant currency sales for 2012 decreased 4% compared to the same period in the prior year. The Company reported a net loss, after preferred stock dividends, of $110 million or $0.39 per share for the full year of 2012, compared to net earnings, after preferred stock dividends, of $60 million or $0.22 per share for full year of 2011. Adjusted for charges, net earnings, after preferred stock dividends, would have been $9 million or $0.03 per share for 2012. Adjusted for charges and certain tax benefits, the 2011 net loss and the loss per share, after preferred stock dividends, were $8 million and $0.03 per share, respectively. Total Company operating expenses decreased $114 million for full year of 2012, when compared with the prior year period including the benefit from one fewer week of operating expenses in 2012. Total Company operating expenses for 2012, when adjusted for charges, would have decreased by $185 million compared with the prior year period including the benefit from one fewer week of operating expenses in 2012. EBIT, adjusted for charges, was $131 million for full year 2012, compared to $122 million the prior year. Capital expenditures for 2012 were $120 million and are estimated to be about $200 million in 2013 to fund ongoing capital maintenance, North American Retail store downsizes and other investments needed to drive the Company’s strategic plan. The Company generated free cash flow of $59 million for the full year of 2012, including a negative $58 million impact to Free Cash Flow from a first quarter of 2012 pension settlement that was offset by a positive impact to cash flow from investing activities of the same amount, with the net result of having no total cash flow impact on Office Depot. On February 19, 2013, the Company entered into a definitive merger agreement with OfficeMax Incorporated, pursuant to which the Company and OfficeMax would combine in a tax-free, all stock merger transaction. At the effective time of the merger, the Company would issue 2.69 new shares of common stock for each outstanding share of OfficeMax common stock. In addition, at the effective time of the merger, the Company’s board of directors will be reconstituted to include an equal number of directors designated by the Company and OfficeMax. The parties’ obligations to complete the merger are subject to several conditions, including, among others, approval by the shareholders of each of the two companies, the receipt of certain regulatory approvals and other customary closing conditions. At the end of the fourth quarter of 2012, the Company had $671 million in cash and cash equivalents on hand and $699 million in availability under the Amended and Restated Credit Agreement, for a total of approximately $1.4 billion in available liquidity.